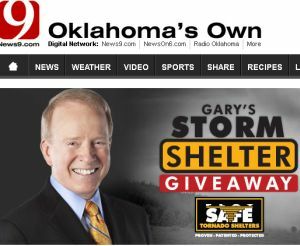 This year they’ll be giving away 47 storm shelters – 2 each day from April 22 through May 2, 2013. How can you win? Watch News 9 This Morning starting at 5 a.m. for your chance to text the keyword to win. Then watch News 9 at 10 for the cue to call with the keyword and you could win!